6000 Square foot luxury home in town! Walk to everything! Hot tub, Huge Yard, and Gourmet Kitchen! 18 Gothic is located on the historical side of town and boasts 6 bedrooms, 6 and a half baths, a gourmet kitchen, HOT TUB, and home gym. 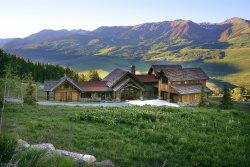 This spacious home is perfect for your next family reunion, ski trip, or just getting away in grand style. Everyone is comfortable when you stay at 18 Gothic, the heart of Crested Butte!. Stepping into this home you realize how much thought was put into creating a unique space. While some homes have large kitchens, this home has a kitchen the size of an entire log cabin! In fact, the old timers say the log cabin was originally moved down from the mining town of Irwin, after which, it was converted into the gourmet kitchen you see today. The kitchen has room for the whole clan and boasts 2 sinks, multiple prep areas, double ovens, and a six burner gas cook top. There's a farm table for 8-10 people as well as access to the outside deck with patio furniture and HOT TUB. Above the kitchen is a queen bedroom and full bath accessed by a one of a kind log staircase. The artist that created the staircase has since passed on, thus leaving only a few like this one in existence. A half bath is conveniently located off the kitchen, as well as,a large laundry room with small desk area. Just outside the kitchen, there is an oversized dining table that seats 12 in the two story dining hall along with a wet bar area built for entertaining that has a wine fridge, sink, and ice maker. Off the dining room is a sun room with seating and an additional full bath with steam shower. Also on this level is a family room with wood burning fireplace, large flat panel TV, and a wall of picture windows that look out onto the beautiful backyard. Down the hall you will find 3 bedrooms, 2 baths, and a second set of washer/dryers. There is a queen bedroom with en-suite bath, a bedroom with twins, and a queen bedroom. A full bath in the hallway with dual vanities is for both of these bedrooms to share. Heading up the stairs to the second level you will find a bedroom with two twin beds on the way to the rec room with a pool table that converts to ping pong for those late night family grudge matches! On the second level of the home is the master bedroom with king 4 poster bed, large sitting area, and windows offering an incredible view of the mountains to wake up to. There is a great master bath with oversized shower and extensive tile work. Down the hall is a queen loft area with it's own bath and secret back staircase to the lower level should the need for a midnight snack arise. Don't worry, if too many snacks are in the equation, this home has a fully equipped home gym to help get the vacation waistline back in check. Simply put, there is not another home in town that offers the size and versatility of 18 Gothic. Whatever the season, event, or family gathering, you owe it to yourself to stay in one of Crested Butte's great homes! Ironhorse management team was fabulous in helping us to find the right house for our family. It met our expectations . We loved the house , the closeness to town , the restaurants were delicious.... tried most of them during our stay. It was a trip to beautiful Crested Butte where many family memories were made . Jennifer and Cindy are my heroes. They saved me every time I needed anything, from folding tables to dehumidifiers. When we needed to print something in-house, Jennifer was sweet enough to bring her very own printer for us to use. I truly feel blessed to have had Iron Horse Property while filming Whatever, USA. The home was absolutely breathtaking and the perfect balance between luxurious and cozy. 18 Gothic is a fantastic location with too many amenities to count. I would recommend it to anyone, and cannot wait to stay there again! The staff was friendly and quick to respond. 18 gothic was a great house, with space to accommodate our group of 12, including a table large enough to sit all of us and a great backyard to play games and hang out. The kitchen was fully stocked with every kitchen appliance and amenity we needed. I would definitely recommend Iron Horse and this house! Only concern was that the refrigerator door did not close very well, and thus the refrigerator was never very cold. MANAGER RESPONSE Thank you for your input. We have a new refrigerator on order and should have it installed within the next two weeks. I'm glad you had a great time in Crested Butte. We are seasoned veterans of using Iron Horse properties and with good reason --- their properties are better and their staff is better. They are all about customer service. If we ever purchase a property in the area, we will definitely use Iron Horse to manage it. Until then we look forward to our next stay. We were very pleased with this house. There were 12 of us and there was more than enough room for us to hang out comfortably. We were all able to sit at the dining room table for meals which was important to us. The kitchen is large enough for multiple chefs to work at once, the amenities were perfect for us (pool table, hot tub, great location, large heated garage), and the beds were comfy. Finally, the price was very reasonable considering the location and size of the house. This was a perfect place for our Group! Plenty of space and great location. It had everything we needed. Office staff was always friendly. 18 Gothic is an amazing house. We were there for our daughter's wedding and the layout was perfect for the occasion. Lot's of room for family and the third floor served for the bridesmaids' preparation. We even had an extra bedroom! Jennifer and Cindy are my heroes. They saved me every time I needed anything, from folding tables to dehumidifiers. When we needed to print something in-house, Jennifer was sweet enough to bring her very own printer for us to use. I truly feel blessed to have had Iron Horse Property while filming Whatever, USA. The home was absolutely breathtaking and the perfect balance between luxurious and cozy. 18 Gothic is a fantastic location with too many amenities to count. I would recommend it to anyone, and cannot wait to stay there again! A beautiful and delightful home to enjoy the cool weather! What a truly lovely home and town! What will always stand out in our minds when we think of Crested Butte is the natural beauty of both the land and its people. Thank you for sharing your incredible home! We LOVED this home and can't wait to see it in the warmer weather! Thanks for everything, especially for arranging for all the snow!! We enjoyed the "Big House" 18 Gothic and thought your services were very professional. Maximum of 5 vehicles on property. All vehicles must be parked in driveway and 1 space in garage. No street parking. No trailers.